This concise article will answer every question you never thought to ask about raising Muscovy ducks. They are the most wonderful creatures that make great pets, eggs layers or backyard flock. OK, get your sniggering out of the way. This is what a handsome, red blooded male Muscovy Duck should look like. What Makes a Muscovy Duck Special? Muscovies are not related to any other duck, in fact some believe they are descended from geese rather than ducks. They originate from South America where their name is believed to come from their insatiable appetite for mosquito’s and their larvae. How great is that – a critter that turns mosquitos into tasty protein! They also have a penchant for flies, small slugs, snails and even frogs & newts. The most obvious difference between them and ‘other’ ducks are the carruncles (the red stuff) on their faces which is more predominant in the males. Interestingly, in females the bright red dulls to a deep orange when they’re broody, right through to raising their ducklings. A blatant visual warning to the males to stay away! Another difference is they have long, sharp claws which are used to attach to tree branches at night when they roost. Due to these claws there’s a right and wrong way to pick up a muscovy and the wrong way will end in bloodshed – yours that is. Put your carrying arm over and around its body, pinning both wings in place and taking hold of one or both legs (depending on the size of the bird and the size of you) gently but firmly. This needs to be done pretty quickly. as if they start to struggle with you they’ll lash out trying to find their feet, and you’ll have first hand experience of those claws. Always an idea to do this manoeuvre with the duck facing backwards, as if they decide to relieve themselves whilst being carried you’ll end up wearing it down your back. Yep, sadly I speak from experience. Ducks eggs are the richest, creamiest, smoothest eggs going. Actually, I feel so passionate about them that I’ve written an entire post on why duck eggs rock. However, as wonderful as the Muscovy duck is, this isn’t the breed to get if you after an egg laying machine. You may want to consider a Khaki Campbell or an Indian Runner as they lay far more per year. This is where Muscovy ducks excel, the meat is dark and very lean. If you’ve ever bought a supermarket duck (in the UK Aylesbury’s are the most common meat bird sold) to roast at home you can almost watch the bird shrink in the oven, as the inch or more of fat under the skin melts. This is all very well if you want to roast a gazillion potatoes to accompany the meal, but if you are striving for a healthier diet then the lean meat of the muscovy duck is definitely the duck of choice. It’s worth knowing that the boys weigh in much heavier than the girls, and if you’re not sure of the age of the bird I would recommend a very slow roast to tenderise the meat as it can be tough on an older bird, and baste frequently as it is so lean. In the summer months our birds will require very little extra food as they forage plenty, but in the colder months they’ll need feeding a duck or unmedicated chicken feed twice a day. If you are growing them to eat, put them on a growers ration, but if they are just for laying or for looking pretty a layers ration will be fine. Make sure they have plenty of clean water close at hand as the dry food alone will make them poorly. When a Muscovy duck is ready to start her brood she’ll find a nice, quiet nest site. You may have things lying around your homestead that will make great nest boxes. Think buckets, half barrels, large plant pots, wine boxes, dog crates etc. They can all be put to good use by a broody Muscovy duck! She’ll start laying an egg every day in her new nest. As time goes by she’ll start to pick out the soft, fluffy down from her chest to line the nest with. Then, when she has her perfect number of eggs in place, she’ll start incubating them. If you spend a lot of time with your ducks, you will see a change in her behaviour at this point. She will go from generally fussing around her nest and sitting down just to lay an egg, to sitting with great resolve and dedication for around 23 hours a day. At this point you can start counting, as the first day she sits with dedication, is day 1 of the eggs being incubated. During this time don’t disturb her, and keep her safe from predators and vermin. She will only come off her nest to eat, drink and poop once or maybe twice a day. I will give you fair warning, the poop from a broody Muscovy duck is revolting. It stinks, it’s explosive and you do not want to be any where near her when she expels it! It is imperative that she has food and clean water available at all times. In very dry weather she may leave her nest more frequently to bathe, thereby increasing the humidity of the eggs when she back down with wet feathers. Please ensure you change her water at least daily. As only a fertile egg will hatch, if you haven’t got a male Muscovy, you know the eggs are infertile. However long the mamma sits on them, nothing good is going to come out of that egg! So, although it feels very mean, it is worth waiting for the duck to leave her nest. Then removing and disposing of the eggs. A female duck loses condition the longer she sits on a nest. If you know they will never hatch, the kinder thing to do is get her off them asap. How long do Muscovy eggs incubate for? A Muscovy duck egg needs 35 days to fully incubate. 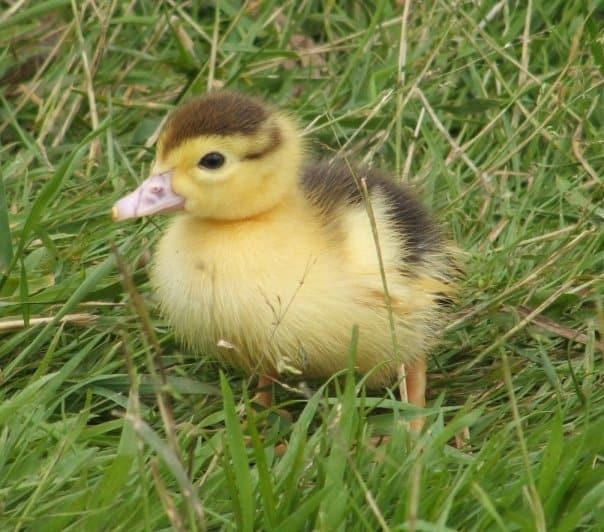 Interestingly, other breeds of ducks only need around 28 days to incubate. Muscovy ducks make fantastic mothers. The most eggs we’ve had one hatch is 15, which is pretty amazing as the girls aren’t all that big. We have had Muscovy ducks hatch chicken eggs too. Although that can lead to problems when the mamma duck wants to teach her chicks to swim! The ducklings will need access to water from day one. However they won’t need duckling feed until day 2 or 3. In the interim they digest the remainder of the yolk in their digestive systems. If you can’t find duckling food, you can use an unmedicated chick feed. Or, as a last resort, you can grind up some duck feed in a kitchen blender. Obviously this isn’t the perfect nutrition for a duckling. But if you have an unexpected brood of Muscovy ducklings turn up at your door, this will suffice until you can get to the farm store. If a Muscovy duckling is bright yellow with a pink beak, like the ones below, they will grow up to be a white Muscovy duck. If they are yellow with any black in their beak then they will likely have patches of a darker colour among the white feathers. When the ducklings are yellow and black, they will grow up a bird that is black and white. Instead these guys nod their heads and have a gentle kind of hiss as a greeting. Oh, and they wag their tails. Seriously they are really cute to watch. Left to their own devices, they would be far happier sleeping on a tree branch safely out of harms way than on a pond or in a hut, and they are the one duck breed not so in need of a large area of water. We’ve raised birds here with just a 4 inch deep tray of water, a cat litter tray is good and pretty hard wearing. So long as the water is deep enough to get their nostrils and eyes under then it’s fine. It will need changing twice daily as they will drink, clean, and probably poop in it, and everything around this area will get very, very muddy. If you do venture into the world of duck keeping, I’m sure you won’t regret it for a moment. Please, do let me know how you get on! Hi Kelly, I have a kept a young male alongside my alpha male with no problem. I think the issue comes into play when there are too few females to 2 males. It sounds like you have 6 females, so 2 males should be fine. If the young male becomes aggressive & continually tries to kick the original drake off the top spot, you may need to choose one only to keep. We have a black Spanish male turkey and 11 Muscovy ducks, 9 females and 4 of them have been sitting on eggs for weeks now. One is in her lay box inside their duck house (12’x12’x12′). Their house is inside a very large fenced dog run (we live on several acres). The other mothers wandered out of this area for their nesting. Our dog is not left in the dog run/duck area unless we are present (out of an abundance of caution). Our nights are cold, just above freezing, and the days are mid 50’s to mid 60’s right now. Should I bring the mothers and eggs inside now before they hatch or wait until they hatch? I don’t want to disturb their nests if not needed but am worried about the babies freezing upon hatching. Also, when I bring the mother and babies inside the house (we will have an area in our laundry room for them with a heat lamp), do I allow the mother ducks out for awhile during the day? And, assuming the 4 mothers’ babies hatch near the same time, does each mother and her babies need their own “home” inside the same laundry room? This is our first attempt at hatching, which wasn’t planned at all, but then we discovered they were nesting under bushes. Getting excited and worried at the same time. By the way, these ducks and our turkey are wonderful pets! They each have their own personality, know their names, follow us around – our turkey has taken over the job of herding the ducks, lol! Thanks for your help! I have moved nests in the past, but would only ever do it again if the birds were in immediate danger. The babies won’t freeze when thy hatch as the underneath of mummy duck is soooo warm. When you do bring them in, it’ll make life so much easier if you can let them come & go as they please. Do keep an eye on them that their is no fighting or aggression from your other animals, but fingers crossed they all get on & observe their boundaries. Hope that helps & please do let us know how you get on! HI Jane. I am in South Africa and we have 8 Muscovy ducks which we adore. We have two broody females who are persisting on being broody….it’s two months now!! We have broken up their beautifully made nests, we have raised them off the ground onto a wooden stick deck…we have seperate them into “solitary confinement”…no good. They just keep sitting, we have to pick them up to get them to their food tray…they have stopped foraging, (our ducks are free range all day), we put them on the little dam a few times a day and they’ll stay for awhile then rush back to a spot to sit…..we Sr desperate! Please help! Hi Kathleen :) Oh bless them. I’ve never had this issue but from everything I’ve ever read on the subject I would say keep doing what you’re doing. One thing, if they are together, I may try separating them – so they can’t see or hear each other as there is a chance they are winding each other up into continued broodiness? Morning Mark, great to hear from you! OK, if it were me I would try and capture the birds (how likely is this?) and have an enclosed run in place at your new residence that you can pop them in. If they currently live free they won’t exactly be thrilled by this, but if you keep them shut in for a week or two I would hope that they would choose to stay when you let them out again. If possible make the run walls out of something they can see through so they can see the lake and get used to the sounds and sights of their new home. I’m afraid I have no definitive answer as to whether this will work or not, but wish you all the luck in the world. Please do let me know how you get on! I have 2 Muscovy male ducks. They have been hissing a the chickens. My husband went out to see them and they had one of the chickens down on her back. What can I do to stop this. We were told to put them in with the chickens to keep the predetors out. But now that they have gotten older, they are getting mean with the Chickens???? What do I do????? Hi Denise, they need a girlfriend. Ideally one male to two or three females. If you want to keep both boys together, you need a lot more girls to sto them fighting. I inherited some muscovy ducks with the house I bought, they are right in with the chickens. However the ducks aren’t laying at all. Do they only lay in the spring/summer months? Also, they seem to eat a lot more than the chickens, so I’m worried the chickens aren’t getting enough to eat. Hi Robin, yes they aren’t the most productive laying breed of duck so don’t expect egg sin the colder months. i have a male on who is maybe about 6 months old, we got him from a family whos child chased it with sticks around there yard and its started agressivly pecking at us now we have him and read you hold him down and he will calm down. but another reason we were told was that he wants a female with him to mate with and not sure whats the right answer to why hes pecking he still pecks abit when touched so maybe hes frightened he will be attacked is this a thing he will grow out of or he’ll do this from now one? Hi Katy, sorry but I don’t sell Muscovies and I live in the UK so not really able to help you find some locally. HELP! Is there a way to discourage a female from incubating eggs? I would like a (wild) female Muscovy to continue laying eggs in same spot (like you might have a chicken do for egg collection) so that she does not find an inappropriate/unsafe spot, accumulate & incubate eggs. I DO NOT want the eggs hatching. She will sit on as few as one now. This seems like a fine line, if could be achieved at all? If sitting is hormonal, is there a way to break the cycle, ye keep her coming to the same spot? (full explanation below if you want to wade thru it). Thank-you for any help or suggestions you might give me, and for sharing your knowledge to everyone. In a word, no. She’s a wild bird so you’ll have your work cut out for you trying to make her fit your plans I’m afraid. If you want her to stop sitting in the flower pot, you need to remove all the eggs from it. My girls are all free range on our farm now, just comign to the back door for feed a few times a day. If they make a nest somewhere and I remove the eggs, they find somewhere else to lay. The only way to make her lay in the same spot for you, is by shutting her up in a vermin proof run. Muscovy ducks are an invasive species in Florida. Also their poop can sicken dogs who step in it and lick their paws. I’d heard they were classed as vermin in some places Bruce, but not about the danger to dogs. Thanks for the info. Hey Olivia, I have no idea why they do this if I’m honest. I’ve only seen it once from my oldest mother duck who has always been the most maternal of ducks. We have been raising French White Muscovies for over 5 years and have had over 100 ducks at one time or another. They are split into 2 flocks. We found out that the best way of looking at them is not individually, but as a flock. If they decide to eat a baby when it is hatching, it is the mother taking care of the flock. There must have been something wrong with it. If they shun a baby, just let them “do their thing” and turn a blind eye to it. So many times, in the beginning, we took in the “shunned” baby duckling, raised it ourselves, and if it even lived, it ended up having eye problems, was lame in some way, or other health problems. We cried and cried over them until we took on the “flock mentality” and let them do what God gave them the instincts to do. We have a very healthy flock now – no weird eye problems, or lameness. It is super hard to harden your hearts not to “save” those yellow fluff balls, but in the end, doing it the “flock way” is actually more human, LESS emotional and way better for the flock. p.s. We have the original Papa/Granddad duck “The Professor” or “Professor Dilly Dally” or just “Dilly”. He has the greatest temperament, hence, we have very sweet ducks and drakes now. He got lame in a fight with another drake and has been partially lame since. I’ve recently started to massage his legs, thighs, neck and spine, and he responded to this fantastically! He LOVES his massage, and is able to stand up and walk a bit after it. We also used swimming therapy for him – letting him swim in an enclosed tub (horse trough with a plastic dog house on top) He swam for up to 3 hours in there and was able to walk out on his own afterward. being about to move the leg AND not having his full weight on it, really improved the lameness and he was able to walk almost normally. He began to lose his buoyancy when he molted so we had to stop and he went back to being lame again. Hey Carol, I hear you. It is SO hard to make those decisions, but I agree that they help the flock be healthier, and save a crazy amount of tears too. Amazing that your drake loves his massage, so cute! And good on you for making his old age more comfortable, keep up the good work! Hi Jane, I’m really hoping you can help me. I live in Miami, Fl and have a situation with Muscovy baby ducklings that are in danger. Of course no Wildlife rescue group will help me since they are not protected here. So Mama duck and her 12 ducklings have been visiting my front yard for the past 5-6 weeks. I’ve fed them regularly and they’ve always hung out at or very near my home. But suddenly, about 3 days ago, only the ducklings showed up. Mama was nowhere to be seen all day. The next day, same thing. I became worried for their safety and decided to catch and trap all 12 of them (what a mission that was!). Even after all the noise they made, no Mama appeared. So I had to assume something really bad happened to her and she was gone for good. I’ve been keeping them in a crate, safe and with plenty of food and water but they refuse to eat. Then today (3rd day of her gone missing), Mama suddenly appeared! I was so happy!! She was wagging her tail and they all ran up to her and they all walked away together. But several hours later, I saw the babies all by themselves, again, all huddled up in my front yard. No mom to be seen. I am so saddened by this! I now have to assume that she is abandoning them on purpose! Or maybe they are refusing to follow her? Either way, I’m so worried for their well-being… they are unprotected and not eating. I know it’s especially dangerous overnight. Please tell me… do you have an idea of what could be going on and if there’s anything I can do to help? I don’t know how long mom will be gone for this time and if she’s even coming back! Is it best that I trap them again? Or leave them out for mom to come back for them again?? I know they wont make it without protection! Thank you so much in advance for any info that you can provide. Like humans, sadly not all mummy ducks are great mothers. The mother should be protecting them 24/7 for the first few weeks so chances are she’s just not that into being a mummy. Hello Jane and thank you so much for taking the time to respond and for your kind words. So an update: mom did come back a whole day later but it seemed that the only thing she was interested in was food. I got so happy when I saw her again until I saw her pecking at the babies whenever they tried to get close to the food. She wanted it all to herself. It actually worried me how aggressive she was getting. She left as soon as she was full and her babies didn’t follow her this time. So I started planning to trap them again and do my best to raise them until they could be on their own. But lo and behold something magical happened!! The next day, a lady came to my house to pick up a dresser that I was giving away for free. It turned out that she runs a cat rescue organization but had plenty of experience with all sorts of animals, including ducklings. She volunteered to take them all, raise them for a few months, and release them by a canal next to her home, where she’s released others in the past. Btw, I did take down her info and her rescue group is legit . I am sooo happy and thankful for those babies’ luck!! had a lovely read and learning lots from your page. I acquired a breeding pair in December and now have 11 ducklings. Well not ducklings anymore as mother hatched in May – they are 15 weeks now. However, just recently the mother douck has out casted two of the ducks which judging by their size are females. They are now not allowed in the duck house. Is this common place and would anyone know the recent for such aggressive behaviour towards two of their own? Awww, that’s sad :( To be honest, we’ll never really know why an animal does certain behaviour, but I’ve not personally had this happen with my girls, although it is pretty common between the boys. Perhaps they are seen as a threat of some sort? 1 of our 2 Mucovy mums just hatched an egg 1 of 8 60 days after she laid it…The other mum hatched 6 from 9 in 34 days…That must be some sort of record ? I just got my girlfriend a Muscovy duck for our anniversary called Charlie. We have no idea if it’s a boy or girl yet so we’re guessing it’s a boy for now. Is there anyway to find out while he’s about 6 weeks old? Also is there any other tips you could give me about raising him? Like can he be potty trained? Or how much living space does he need when he’s fully grown? Hi Ben, my number one tip for you would be to get two other ducks for ‘him’ to live with. Ideally you’ll have one male and two females. They are highly sociable creatures, and if it is a boy, and you keep him with no female to relieve his testosterone on, he could well end up attacking you (or certainly a female) as he tries to dominate her. It may sound weird, but it’s happened to me. We had to cull the duck that I adored so much because I’d spoilt him. No, I don’t believe you can potty train a duck, although to be fair I’ve never tried. I believe you can get nappies for chickens, so possibly you can for ducks too? Sorry, no idea. I don’t know if anyone is still here but I found this great page after I was trying to find out more about Muscovy ducks. A pair have been dumped at a local wildlife spot. We know it’s “dumped” as both have been pinioned so they did not fly there themselves. We visited two or three times a week to supplement the food for the other ducks and swans and have really taken to Terry and June as I have named them. Terry is awesome. Whenever he sees us get out of our vehicle he runs to us, tail wagging. He makes a kind of panting noise, which I guess is the hiss you mentioned. He reminds me of a feathered dog. June is not quite as exuberant but is always ready to have a good scoff of the grain we give them. I am curious though about the extra feeding in the winter months. Should we go more often with more food during the winter? Or encourage the locals to take food into them as well? Or will they manage with the couple of days a week alongside their natural food? I guess it would depend on the amount of other birds there, the amount of wild food available to them around the area they live and how cold your winters get. Personally, I wouldn’t let my flock skip a days feeding, but they’ve been brought up here with constant access to food. If they are on a public pond I’m guessing other people go to feed them? PS aren’t they the best? They really are such friendly birds! I have a question for a friend of mine . He has a small pond , he has install more then one shelter .and the ducks don’t go in them . He lives in Connecticut and the ducks just stay out in the cold . Is ok for them to be out in the cold weather .He is also worried they may become food for coyotes and fox if their out in the open . .
Hi Philip, free range ducks will nest wherever they choose. Sadly it may take an attack to teach them that their chosen place isn’t ideal. Short of shutting them in at night, there’s not much that can be done I’m afraid. So, this is not quite right. Muscovies are quite definitely related to “other” ducks. Now, other domestic ducks are placed in a different genus and species and are, therefore, all much more closely related to each other than Muscovies. However, if they were not related at all, they could not be hybridized. But they can be hybridized, resulting in what are known as “mule ducks” or “mulards”. .
Muscovies are placed in a subfamily with wood ducks and Mandarin ducks (which also perch and nest in trees). I believe the confusion comes from the fact that this subfamily also includes a number of ducks that look like geese, including Egyptian geese. Other domestic geese are more closely related to swans than they are to Muscovies. But all ducks, geese and swans are in the same taxonomic family and are all related to some degree. Would two female muscovy ducks be OK without a drake? I have 3 hens on my place. And lots of grass I’m hoping they can help keep down. Absolutely, we’ve now removed the drakes from our flock as we no longer want babies. The ladies will still lay and go broody given half a chance, so best to remove the eggs as they go to prevent them sitting on infertile eggs and losing condition. I love your website, so informative! Thanks for all the work you’ve put in. I’m really hoping you can help me. I live by a lake where we had mallard ducks all my life. About a year ago someone abandoned a female Muscovy duck near the late. I adopted her and she has since become my best friend. Unfortunately she has a chronic calcium deficiency which can make her very sick, especially when she’s broody. We don’t have a drake so all her eggs are infertile and I am keen to remove them when the time comes. I noticed, however, that she smells differently when she’s broody and sitting on her nest. Is this normal or an indication for illness? Another question I have is if it’s possible to keep two female Muscovies without a drake? I would love to find a feather friend for my duck. Although she gets on with the mallards just fine, you can tell they are very different types of ducks and don’t speak the same “language”. Hi Julie! Yes, there is definitely a smell to a broody duck. I assume it’s because they aren’t swimming/washing as often as usual. If her eggs are infertile it’s best to remove them from her asap, as she will lose condition the longer she sits on them. Yes, two female muscovies would be perfectly happy together – there will be a pecking order, so you may notice some mild aggression, so please don’t be alarmed if this happens. Hi Bill, and absolutely yes! They don;t need to be duck eggs even, I’ve popped fertile hen eggs under a broody duck and she raised them perfectly (in this instance just be careful if Mummy duck has access to water as she will leave the babies on the shore and they will be vulnerable to predators & the cold. From the time the first duckling in the clutch hatches, how long should we wait to see how many other eggs hatch before disposing of them??? Mama duck will decide when the remaining eggs are no longer viable. She’ll permanently leave the next and mother the hatched ones, the leftover eggs can then be disposed of.